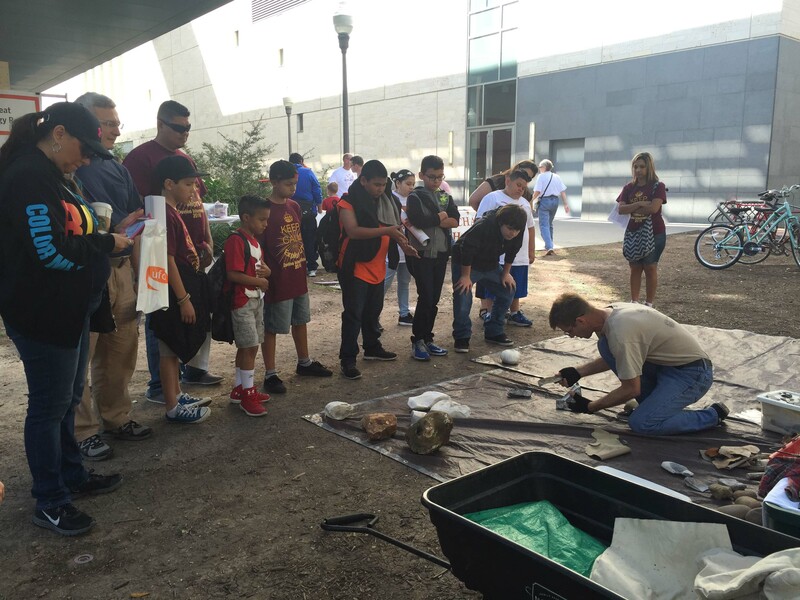 Recently TARL’s staff participated in an annual volunteering tradition: Explore UT day at the university. Each year, UT invites thousands of students of all ages from all over the state to visit the UT campus and participate in educational activities while experiencing a sample of college life. To share our love of archeology with the kids, TARL staff contributes several activity booths to this event every year. TARL’s Stacy Drake teaches students what archeologists can learn from human remains at Explore UT. This year, TARL’s activities included cloth button-making, rock art drawing, artifact ID, and of course lots of coloring pages. 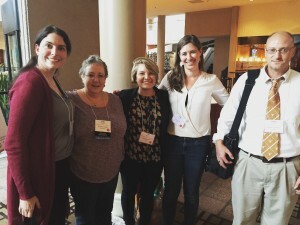 Additionally, dedicated graduate students from the Department of Anthropology contributed very popular activities including human bone identification, grinding with manos and metates, and learning to write names using Egyptian hieroglyphs. We were also very grateful to have archeologist Chris Ringstaff, a friend of TARL and expert flintknapper, on hand to demonstrate stone tool production. As always, Chris’s demonstrations were a huge hit! Archeologist Chris Ringstaff gives a demonstration on chipped stone tool manufacture to Explore UT visitors. 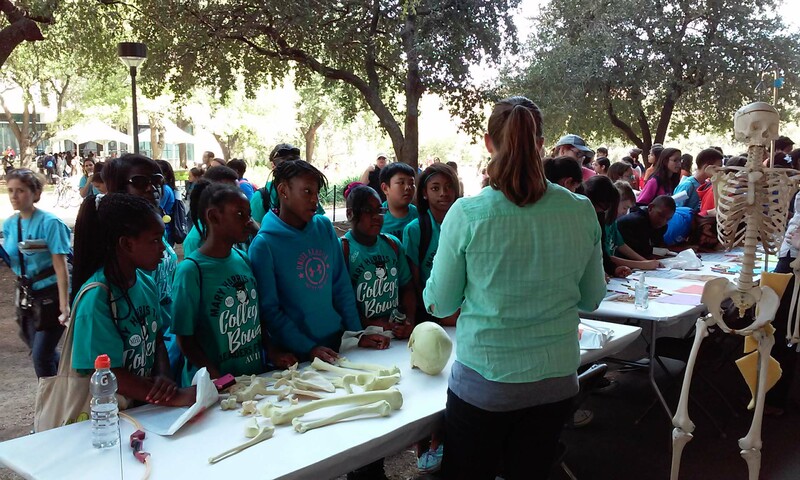 Thank you to the Explore UT team for organizing this great event and giving us the chance to share fun archeology activities with hundreds of students. Thank you also to everyone who volunteered to help make this fun day possible! 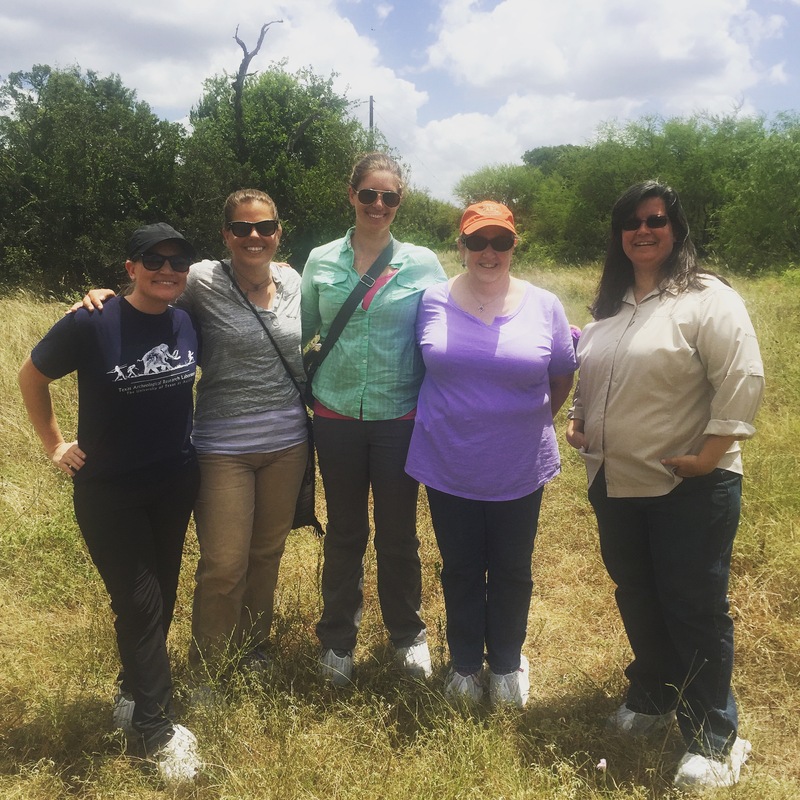 Heather Smith serves not just as Web Developer and Associate Editor of Texas Beyond History, but–having completed her Ph.D. in Anthropology at Texas A&M University—now teaches lithic technology and archeological field methods. Her research into Paleoindian behavior and technological adaptations, particularly fluted points, has taken her far afield: from Texas to Alaska and Siberia for fieldwork, and to museums and repositories across the U.S. and Canada to examine collections. A nine-year veteran with the TBH staff, she brings a variety of talents and experience, including photo communications and graphic design, in addition to her knowledge of archeology, to the website. In a new TBH Spotlight feature, she presents some of her findings on Clovis technology using geometric morphometric analysis. Graphic designed by Heather Smith for the new TBH Spotlight feature highlighting her geometric morphometric study of fluted projectile points. 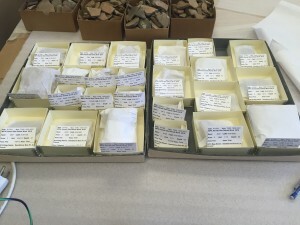 The sample for the study included more than 100 points from 23 sites across the country, including several Clovis caches and a sample of Clovis points from the Gault site. 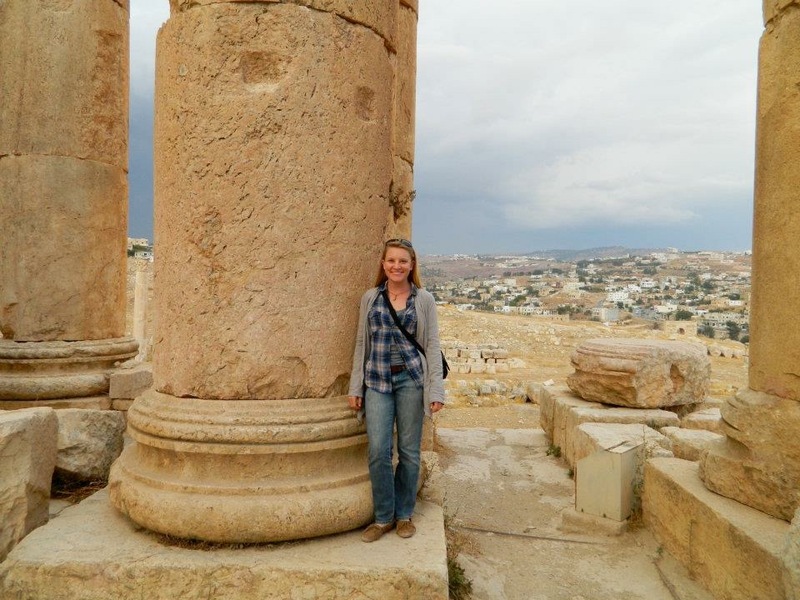 My fascination with Paleoindian archeology began while an undergraduate student studying anthropology at The University of Texas at Austin and as an intern doing web and graphic design for Texas Beyond History. From that early point in my academic career, my interests became focused on late Pleistocene hunter-gatherer research and First Americans studies. As a graduate student at Texas A&M University, I began to sharpen my major research questions on ways human technology and behavior were adapted to past environments. I became curious as to how prehistoric peoples organized their lithic technology, beginning with the acquisition of raw materials, to the manufacture and maintenance of tools, to the loss or discard of tools. On a larger scale, I wanted to research the timing and means of human dispersal events that resulted in the occupation of the American continents. One of my projects involved collecting metric and geometric morphometric data on early fluted projectile points and subsequent statistical analyses of this information. Although this research required me to travel to numerous museums and curation facilities across North America, a major focus was TARL, where one of the most important assemblages of Paleoindian artifacts was being studied: Clovis projectile points from the Gault site. Now as an archeologist, university instructor, and Associate Editor of TBH, I am continuing my research in this exciting field. 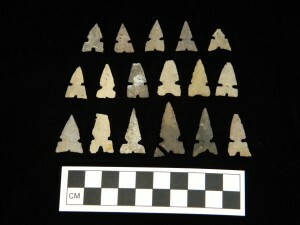 Clovis points from the Gault site used in the geometric morphometric study of fluted projectile points. Photo by Heather Smith, TARL. In a new Spotlight feature on TBH, I explain how geometric morphometrics can be used in chipped-stone projectile point analysis. These and other analytical tools can help us understand stone-tool manufacture processes, variation in chipped-stone points, and provide evidence to help identify patterns in the movements and adaptations of people across the landscape. Interestingly, my findings suggest that Clovis points from the Gault site were more closely associated with other points from the southwest region, including Blackwater Draw in Clovis, New Mexico, and with those from the northwest, rather than with Clovis points from the northeast. Said differently, it appears that the same peoples who occupied southwestern places like Gault were the same cultural groups or closely related to those who occupied the northwest during this early time period. Smith photographing Clovis points at the National Museum of Natural History. 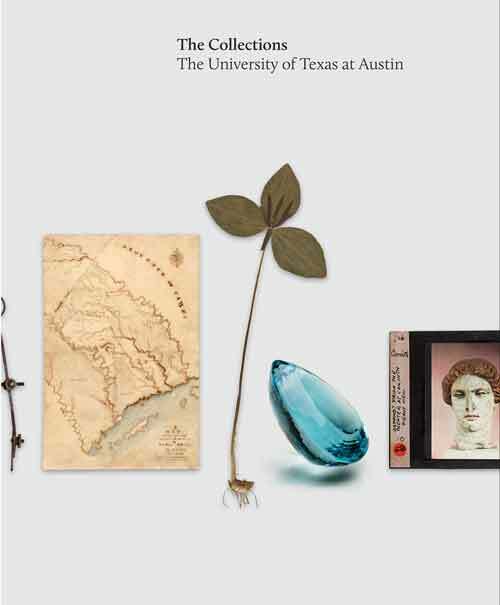 This January, the UT Press released a landmark volume entitled The Collections: The University of Texas at Austin. This beautiful coffee-table volume, edited by Andrée Bober, highlights more than 80 collections of historical, artistic, and scientific objects held by the University. TARL is honored and delighted to have some of our most beautiful artifacts included in this publication. Cat. No. 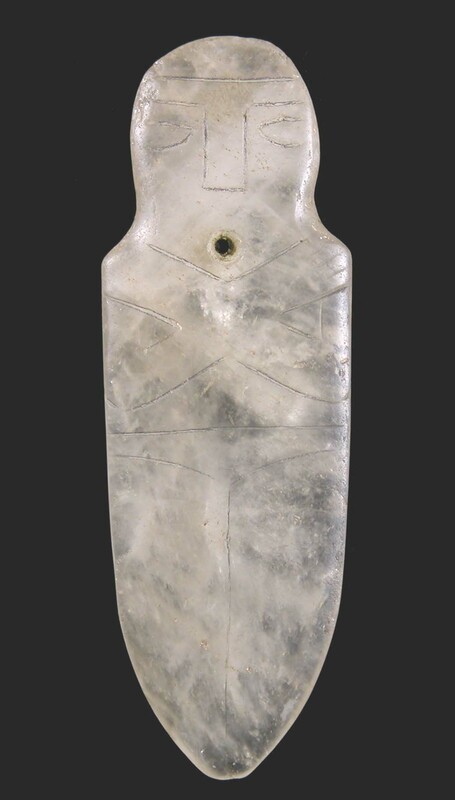 16SA48-209, Incised effigy on ground and polished quartz crystal from the Coral Snake Mound in Sabine Parish, Louisiana. Featured in The Collections: The University of Texas at Austin. The Collections showcases only a small amount of the 170 million objects of significant cultural, historic, and scientific value owned by UT Austin—making the University the largest repository of these objects in the state and possibly in the U.S. 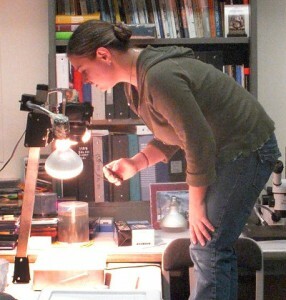 Some of UT’s collections date as far back as 1883 when the university was founded. Materials from TARL highlighted in the volume include gorgeous lithic, ceramic, and perishable items, some of which date to 10,000 to 13,000 years ago. Cat. No. 68, Corner-tang knife of grey chert, excavated by the University in 1974-75 at the Ernest Witte site in Austin County, Texas. Featured in The Collections: The University of Texas at Austin. The inclusion of TARL materials in The Collections was made possible by the work of TARL Director Emeritus Darrell Creel and former TARL Head of Collections Laura Nightengale. Work on this massive volume began more than five years ago, and we are all gratified to see the realization of their labor of love. The Collections: The University of Texas at Austin, now available from UT Press. For more information about the book or to purchase a copy, please visit the UT Press website. Last year, TARL received a grant from the Texas Historical Commission’s Texas Preservation Trust Fund grant program to conduct a collection rehabilitation project on one of our oldest collections of archaeological material. For this project, TARL chose the collection from the Harrell Site, a fascinating site in North Texas that was excavated by the WPA in 1938-1939. 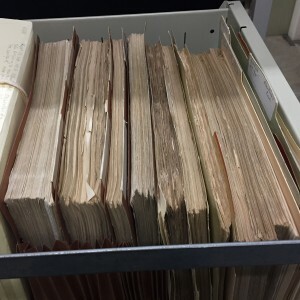 This rehab project was designed to make sure that the site collection is preserved for many years to come, and catalogued in such a way that it can be studied by future researchers. The rehab efforts also served as a pilot project to establish effective and efficient rehab procedures for use on other collections here at TARL. The Harrell Site excavation was one of the largest projects conducted by the North Texas WPA team. Sitting on bluffs above the Brazos River, the site included a massive midden and hearth feature, known as the “Great Midden,” as well as numerous smaller hearths and burials. Two main occupations, dating to the Late Archaic and Late Prehistoric periods, are seen at the site, with continued usage of the site in the intervening period suggested as well. 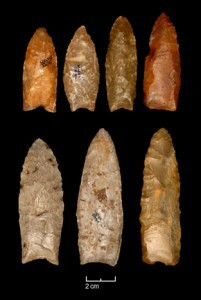 The Harrell site is the namesake for the Harrell Point, a small arrow point, and was considered the type site for the Henrietta Focus by archaeologist Alex Krieger, who analyzed the site collection in 1945. Read more about the Harrell site excavations here. Harrell Points and Thumbnail End Scrapers from the Harrell site. The WPA excavations of the 1930s and 40s were conducted in partnership with UT, and many of the materials recovered were brought to the University back in the 1940’s. But, curation standards in 2015 are much different than they were 75 years ago! 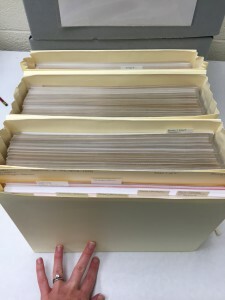 While our newer accessions are stored and catalogued using modern practices, many of our older collections are still stored in the same condition they have been in for 30 years, or 50 years, or longer. 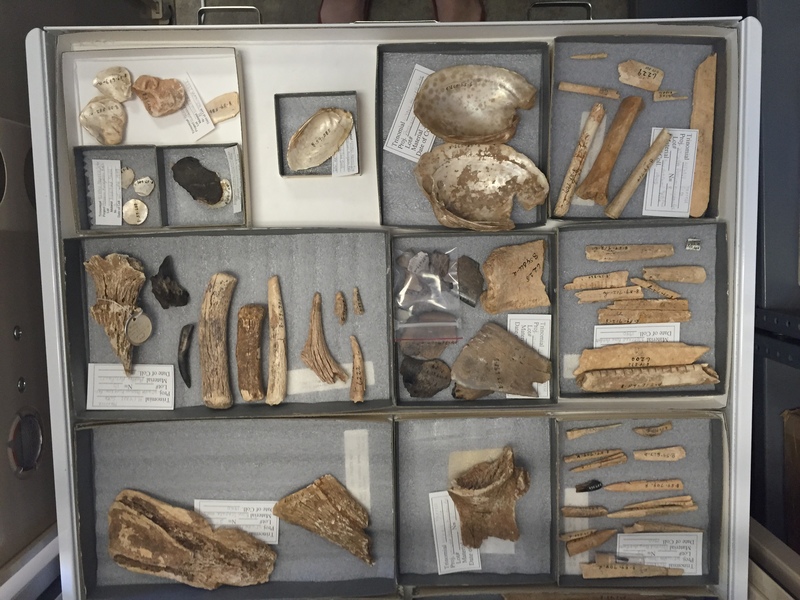 Our grant from TPTF was a rare and important opportunity to dedicate resources and staff time to bringing these collections up to modern standards. Eventually we hope to apply what we’ve learned from this project to all of our older collections. 3. Creating a searchable, state-of-the art database that contains all of the data relating to the site artifacts, features, and records. Harrell site records before and after rehabilitation. As a result of these rehab efforts, the 2,300+ artifacts that comprise the Harrell collection are now individually tagged and repackaged, and their storage conditions will ensure that they are safe for a much longer time. All the site records are organized, protected, and available for digital viewing. And, our database will make it simple to see what excavators found at the site, what we still have, and where to find every single artifact within TARL’s collections. This work has paved the way for future analysis of the Harrell site collection, and for our future rehab efforts on other collections. 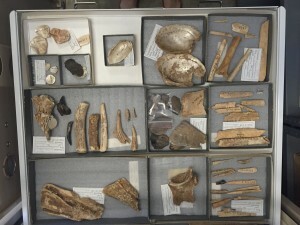 Bone and shell tools from the Harrell site before and after rehabilitation. Rehabilitating the Harrell collection has also been a valuable opportunity to revisit some of the past work that has been done on the site. The artifact assemblage plainly shows that many of the cultural practices inferred by Krieger and others were clearly present at the site: residents were grinding food with manos and metates, probably practicing s ome horticulture or agriculture, and utilizing the abundant mussels from the river as a major food source. 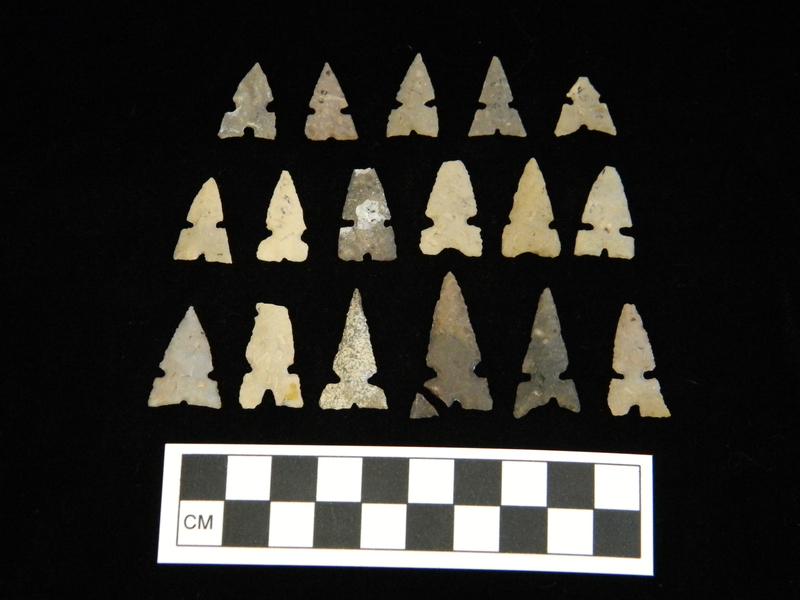 Numerous projectile points of many sizes and types were used for hunting during both major occupation phases. Ceramic pipes and ochre indicate that ceremonial or ritual activity took place at the site, and intrusive burials suggest that the locations of earlier grave sites were preserved in cultural memory over some length of time. • close analysis of the ceramics, mussel shell, or bone artifacts. These are just a few examples of the types of work that could be done using this collection. We hope that this work will spark interest in additional research on this site and other WPA-era collections housed here at TARL. We hope to have a full report on our rehab work—including an online database with photos—available to the public through the TARL website very soon. 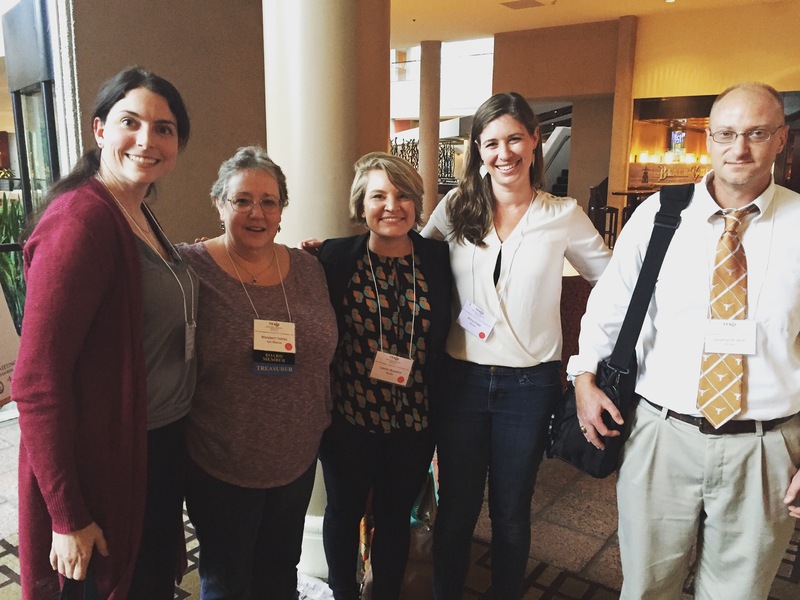 We are extremely grateful to the THC for making this important work possible! Native peoples in Texas used a variety of instruments to create sounds and music throughout prehistory and into more recent times. Among TARL’s vast collections are a number of unusual artifacts likely used during rituals, ceremonies, and other events. Based on the contexts in which the instruments were found, many were used in burial rites. Ethnographic accounts provide additional insights about other circumstances in which similar instruments were played. Crafted of wood, clay, bone, and other natural materials, the instruments’ design and construction provide clues to the powerful range of sounds they emitted. We can imagine the shrill notes of a flute or whistle, the eerily grating noise of a rasp, the quivering beats of a rattle, and hollow rhythms of a skin-covered drum. These otherworldly sounds accompanied shaman’s chants and set the pace for dancers and processionalists. 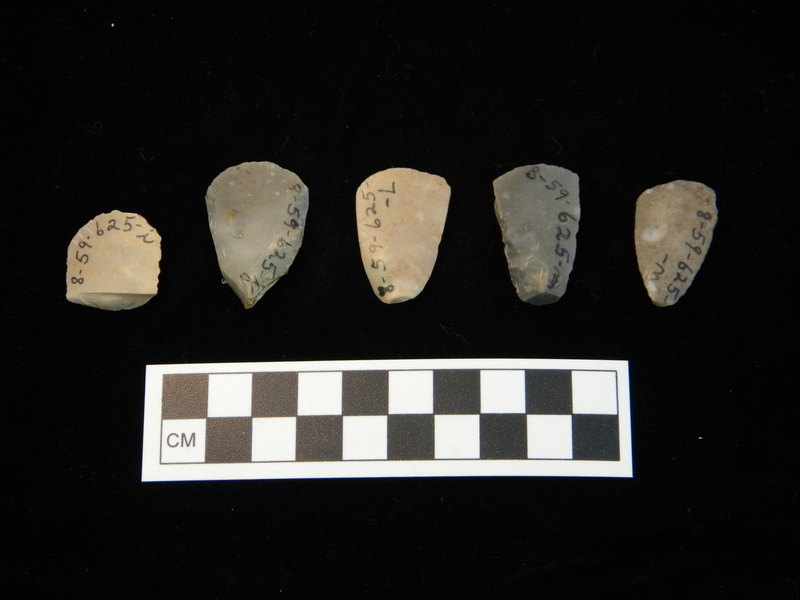 Among the more fascinating music-related artifacts at TARL are 11 bird bone whistles excavated from Late Prehistoric and early Historic period burials at the Mitchell Ridge site near Galveston. All are made from the ulna, or lower wing bones, of the whooping crane (Grus Americana). The bones are hollow with very thin walls, making them good candidates for modification into wind instruments. Whistles have a single air hole, rather than several air holes, distinguishing them from flutes. According to archeologist Robert Ricklis, who investigated and reported on the site, several of the specimens have plugs of asphaltum, a natural tar-like substance emitted from oil seepages beneath the Gulf of Mexico, which partially cover and narrow the air holes. This feature served to control the air flow and cause the whistling sound when the instrument was blown. Four of the whistles are decorated with finely engraved lines in geometric patterns. Similarly engraved whistles made of whooping crane and heron ulna have been found in Louisiana. Drawings of additional whooping crane ulna whistles from the Mitchell Ridge site showing the detailed geometric designs engraved on the bones. Image from Ricklis 1994 (Fig. 18). These undecorated whooping crane whistles were placed in the grave of a young man, 18-20 years of age, at Mitchell Ridge. Note the rectangular air hole cut into each whistle. Photo by Bob Ricklis. TARL Collections. 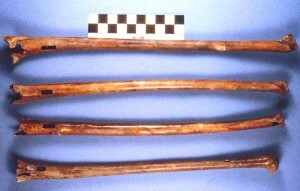 Reed flute from the Perry Calk site, a rockshelter situated high above the Rio Grande in southwest Texas. Unlike whistles, flutes have more than one air hole. The cane-like common reed from which the instrument was made grows in abundance along streams and rivers and was used for a variety of purposes. Photo by Monica Trejo and Matt Peeples (AMIS 2794b). TARL Collections. Artifacts interpreted as rattles are rarely found intact. In some cases, the enclosing container, such as a gourd, deteriorated over time, leaving only the rattle contents—small, regular items such as pebbles or clay balls that would have made an impressive sound when the container was shaken. Prime examples of this sort of extrapolated evidence come from the Mitchell Ridge site where four tight clusters of black drum teeth—interpreted as the contents of rattles—were found in burials. More rarely, rattles are recovered intact or nearly so. At the Caplen Mound cemetery site on the Bolivar Peninsula, a decorated turtle carapace was found laying in the burial of an infant. 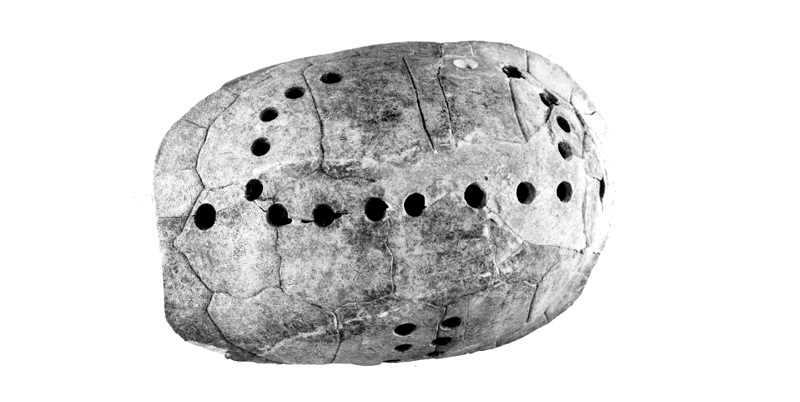 Drill holes in the shape of a “U” suggest the carapace served as a breast plate or rattle. 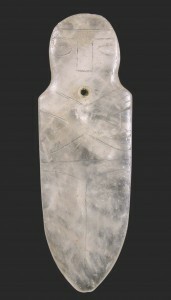 The presence of several glass trade beads indicates the infant burial occurred in the early historic time period. At other south Texas burial sites such as Morhiss Mound, deer antlers and modified antler tips were found in burials, and these have been interpreted as rattles or tinklers, the latter perhaps appended to the clothing of the individual. Tortoise shell rattle found in a child’s grave at Caplen Mound on the Bolivar Peninsula about 25 miles northeast of the present-day city of Galveston. 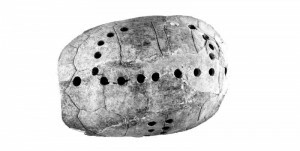 The small shell, decorated with a series of drilled holes and containing several small pebbles, was found in the neck area of the child, and may have been worn suspended from a cord. TARL Archives. This odd-looking clay bowl from a Franklin County Caddo site was crafted with four protruding hollow nodes containing small pebbles or clay pellets. When shaken, the bowl produces a rattling sound. Listen to the sound http://www.texasbeyondhistory.net/tejas/images/rattle-bowl.wav. The bowl is Late Caddo (Fulton Aspect), ca. A.D 1400-1650. TARL Collections. According to Caddo tribal historians, numerous types of instruments—rattles, drums, and flutes—were played during rituals and dances, and some of these rich traditions continue today among peoples of the Caddo Nation. 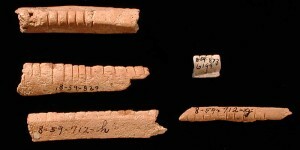 Marked with a series of carefully incised parallel notches, hollow bones such as these have been described as “tally bones,” or counting devices. More likely, they were rasps used as musical or ceremonial instruments. They were recovered from the Harrell Site (41YN1) in north central Texas. 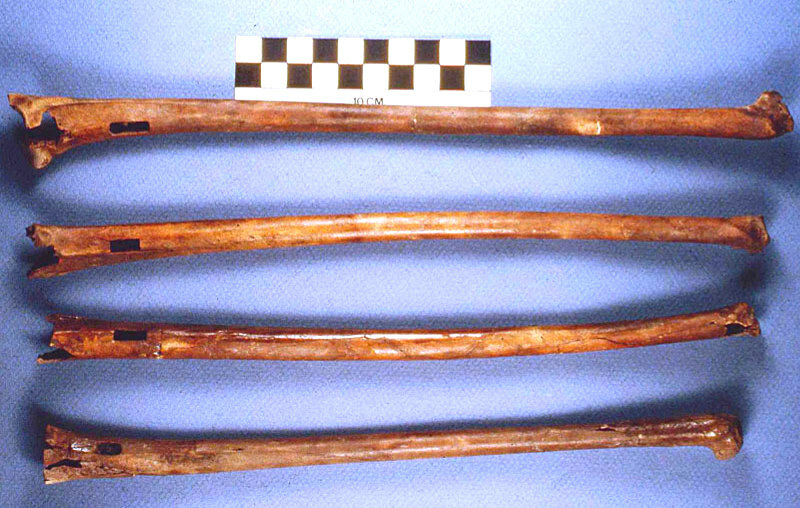 This notched rasping stick from Conejo Shelter in the Lower Pecos region is made of mesquite wood. Photo by Monica Trejo and Matt Peeples (AMIS 23549). Other historic accounts mention the use of musical instruments in battle and in hunting rituals. 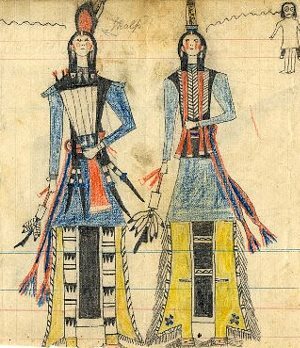 During a 1690s battle between the Cacaxtle Indians and the Spanish in what is now south Texas, an elderly Indian woman played a flute throughout, perhaps to buoy the spirits of the Cacaxtle warriors. As recorded by Spanish historian Juan Bautista Chapa, at the end of the battle more than 100 Indians lay dead and another 70 were taken captive. 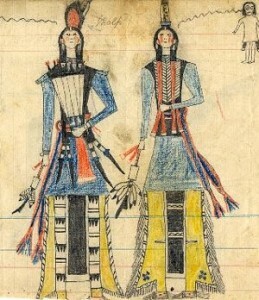 Noted Swiss-American ethnographer Albert Gatschet recorded peyote ceremonies associated with deer hunting among the Rio Grande Comecrudos. This ceremony was accompanied by music from drums and rattles and dancing from elaborately dressed shamans. Achieving a trance state through repetitive music, which typically involved rattles and chanting, was an important component of shamanic ceremonies. Musical instruments played an important role in the rituals and spiritual life of native groups in the past. Witness accounts such as these help bring to life some of the mute artifacts in TARL Collections and provide colorful insights into how some of these fascinating instruments may have been used. For more information about the Mitchell Ridge site, see the multi-section exhibit on Texas Beyond History: http://www.texasbeyondhistory.net/mitchell/index.html. The Credits page of this exhibit includes the full report of excavations by Robert A. Ricklis (1994 Aboriginal Life and Culture on the Upper Texas Coast: Archaeology at the Mitchell Ridge Site, 41GV66, Galveston Island; Coastal Archaeological Research, Inc., Corpus Christi) which can be downloaded as pdf files.